brighten up January - Green Fairy Quilts giveaway! I hope you are still feeling the glow of the new year, your sewjo is rockin' and creativity is abundant! 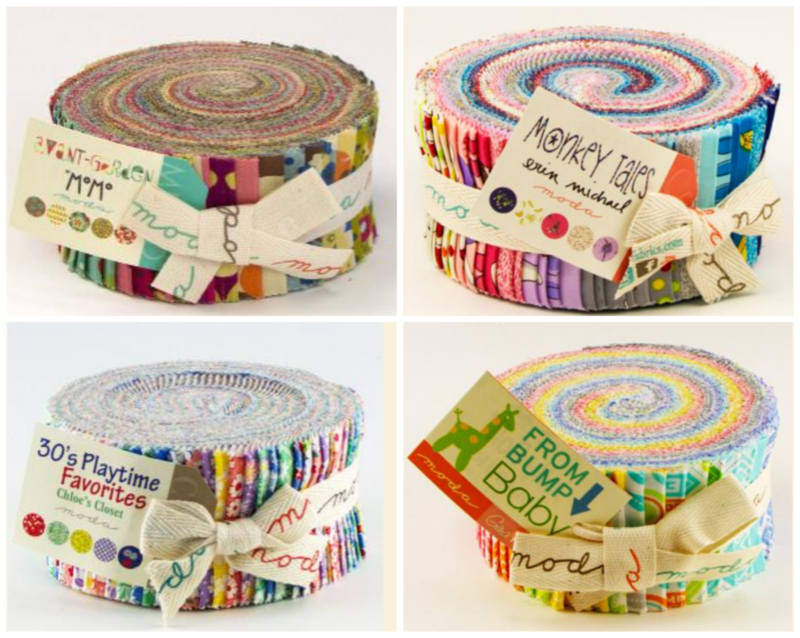 Check out their full stock of jelly rolls to see which one you would chose! But that's not all... it's always great to have a pattern to go with your precut so you get to pick one of these two patterns designed by Judy Madsen. One jelly roll is all you need to make the quilt top and binding! Green Fairy Quilts specialize in always having 100% of Moda's Precuts, always on sale. 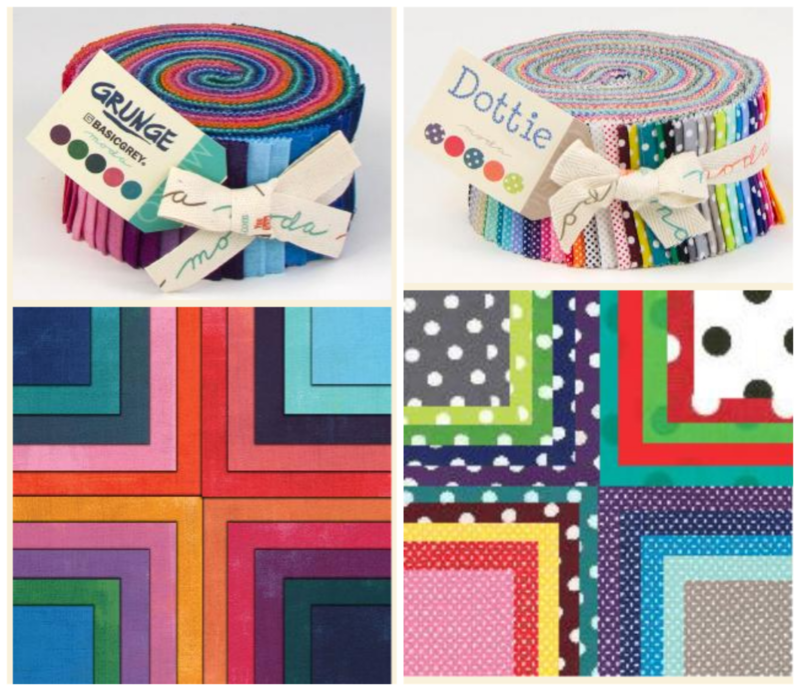 They also have Riley Blake bundles and Quilting Treasures bundles. They offer free shipping in the United States and discounted international shipping. 1. Head over to Green Fairy Quilts and sign up for their email newsletter by CLICKING HERE, come back and leave me a comment letting me know you have signed up. 2. Followers of my blog get another optional entry, just leave a separate comment letting me know you follow (RSS/email/GFC/Bloglovin/Feedly etc). New followers are welcome and you can subscribe using the buttons up there on the right. Please leave your email address in the comment to be sure I can contact you! No reply bloggers/comments will not win. The giveaway is open internationally and will close on Tuesday 27th January, the winner will be chosen by random.org and announced here on that day. I'm subscribed to the Green Fairy newsletter! I'm already a subscriber to Green Fairy quilts! Great shop-I order way too much! Free shipping always! I get already their newsletter. I am a fan of Green Fairy Quilts and already receive the newsletter. I get the GF newsletter. Love their shop! I've signed up for Green Fairy's newsletter. P.S. I'm assuming you don't need my email address but shout if you do!! HI,I already receive their newsletter. Thanks! Been getting the newsletter for a while now. I'm signed up for the Green Fairy Quilts newsletter. I follow this blog via Bloglovin'. I already receive the GFQ newsletter. I have received the newsletter for a while. I'm already subscribed to their newsletter - thanks. I'm a follower with Bloglovin' - thanks again. I already subscribe to Green Fairy's newsletter. I receive your newsletter by email. I follow you through Bloglovin (Rhonda Desgranges). I already receive their newsletter.. And...I also follow you by email...thanks for the chances to win.. I already get their newsletter. They have a great selection of fabrics. I already follow you va bloglovin! I signed up for green fairy! I am following your blog with GFC. I follow, love those dots! I'm a current newsletter subscriber. I already subscribe to the Green Fairy newsletter! I follow you via Bloglovin. Thank you for the giveaway. I subscribe to the Green Fairy newsletter and have ordered several times! I get the Green Fairy Quilts newsletter and I love there selection and prices! The jellyroll I would most like to have is: Moda Jelly Roll - Calypso Batiks, they are gorgeous. I follow your blog by email. Thanks! I already subscribe to the Green Fairy newsletter. I follow you blog via email. Thanks to you and Judi for the great giveaway! My email is meliclo34 @ gmail . com and my FB page is "Made by Meli Clo"... check it out ! I am signed up for Green Fairy" newsletter. I've signed up for the Green Fairy newsletter! Thanks for the chance to win! I love those spots!!! I follow you via Bloglovin . Ruth sews@hotmail.com. A very VERY tempting giveaway! I'm following you thru bloglovin! ...and I just signed up for the newsletter too! Oh I do love a Jelly Roll!! I already receive the newsletter - yay!!!! Lucy, I love Green Fairy Quilts...best prices on Aurifil Thread and pre-cuts. FREE Shipping always:) can't be beat. I' already receive their newsletter and daily deals emails...they rock! Loving the Grunge jelly roll. Got my "Sewjo" for 2015!! Thank you for your inspiration. I follow Green Fairy via e-mail, thank you for the giveaway. Signed up for the newsletter and IG! Great giveaway, thank you! I have signed up for the newsletter. Such a fantastic giveaway! I follow you via bloglovin'. So many great jelly rolls, would be hard to decide! I follow you via email. thank you and Green Fairy Quilts for the giveaway I love the dottie dots by Moda! I am already receiving the Green Fairy Quilts newsletter - thanks!! Awesome giveaway!! I follow you via Bloglovin' - thanks!! I follow you on Bloglovin. Thank you for the giveaway opportunity. Love the 30's Playtime jelly roll. My oldest daughter is due March 1st and I just found out she is doing the baby's room in SOCK MONKEYS!!!! So I would chose the Monkey Tales jellyroll with the Strip This Quilt Pattern for the new one's first quilt form Uma. Thanks for the chance to win & to brighten up my Jan.
quercuszero8two8 at yahoo. The numbers are not spelled but actual numbers. And I follow your blog through Feedly. I signed up for the GFQ newsletter. Thanks! I follow you via e-mail. thanks for the chance. I am signed up for the Green Fairy Quilts news letter.